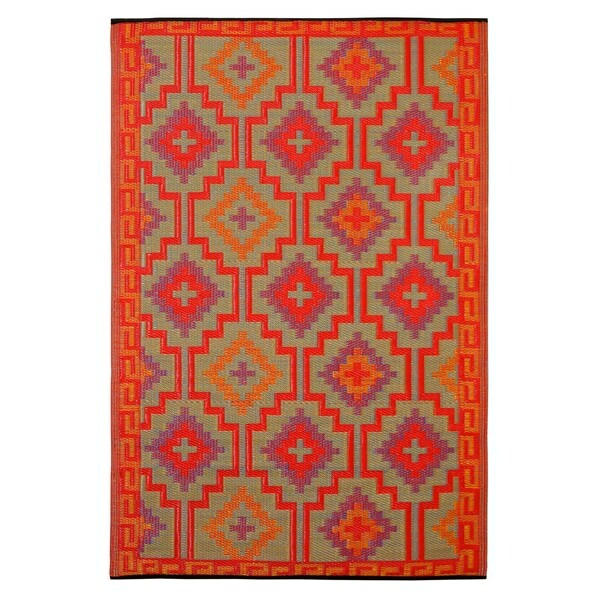 Mesmerizing and eco-friendly, this handsome reversible rug features an orange and purple geometric design and has been made from 100-percent recycled plastic. Since the rug is both reversible and durable, you can be sure that it will last for a long time in your home. This rug is intended for outdoor purposes. It really livens up our backyard and has maintained its color being rained on, in the sun, hail and more over the last 2 months in the Colorado weather. Worth it. I would not recommend buying from you but I loved the product. I have found it at 2 other places at half the cost and that was not a sale price. I was very disappointed when I discovered the discrepancy since I always thought Overstock had great prices. Live and learn. I like this rug and decided to keep it but the main color in this rug is RED. The description says orange and purple are the main colors. Cute rug but nor true to picture. Great color and totally durable for outdoor use. It's made of plastic, so I definitely wouldn't use it inside (except maybe in a mudroom or something if I had one of those). I have this on my little apartment balcony and it's totally no-maintenance and adds nice color and comfort underfoot if I want to walk out there without shoes. I prefer this woven plastic material to the fake-sisal material of many outdoor rugs. Even when it rains or I overwater my plants, this rug is totally clean and impervious to water. Love it. This rug has been outside by my pool for almost 3 months where it gets full sun most of the day (south Texas heat). The color is great, no fading as of yet and when it rains it gets cleaned off. If you want to brighten your outdoor space this is the rug for you. Thinking of ordering larger size and another color by same mfg. offered on overstock. The rug is very light so you will need to make sure it is weighted down if you use it outside. It is very easy to clean and the design is great. The color really pops outside and makes a great and lively addition to the patio furniture. I bought a different rug of the same plastic material a while back and each rug compliments the other. Wonderful plastic rug!!! We've had outdoor rugs before -- but the plastic is SUCH a brilliant idea!!! I have a feeling it will weather the northwest rains far better than previous candidates! Also - super light-weight. Can roll it up, tuck it under one arm and transport easily. (And this is with the largest size) Be sure to check out other rugs by Fab Habitat if these colors are "too shiny, happy" for your color scheme. Thi is a great indoor outdoor rug made of recycled materials. The colors are bright and deep and go well on my deck. It has lasted a few years now. We love this rug! The colors are just fantastic. I don't love the feel of the rug -- it's definitely plastic. It almost reminds me of drinking straw plastic. But that's what makes it so durable. We've had our for two years on a covered porch. i do see some fading in a couple of areas that get more sun, but overall the look of the rug is fantastic and the quality is great. Recommend. What were the reasons I bought this product? This item attracted to me by its geometrical shapes and colours (bright and happy). To add some characters in my not-so-nice patio. When I received it, the materials are feel like plastic. I thought it will be like a synthetic rug material or something like that. The picture on the website it does look like a synthetic rug materials. Anyway, I rolled it to put in my outdoor patio, I'd said to myself: "Even thought it is a plastic material, still a lovely outdoor mat!" It has been weeks passed, the bright and happy colours have started to fade and it looks miserable. I am unhappy about it but it still stay in my not-so-nice patio. Probably it's time to turn it over as it's been raining in our area. Very nice outdoor rug, brings a pop of color to my porch. It is washable, so it make it easy to clean specially with the pollen. made out of cocktail straws. Cant think of where to use this. Its very odd. I think its too slippery for bathroom and too plastic for any other place. Love this carpet. Have it on a front porch that gets intense sunshine and it has not impacted the carpet at all. Also, very soft under foot. The material is a plastic type material but it doesn't detract from the style. I wouldn't recommend for indoor use for this reason. Disintegrated after 2 years outside. doesn't lay flat and too light weight for outdoors... blows away. Not recommended. Very vibrant in person, the purple areas are darker than in the pictures. It’s that plastic-y material which I was a little surprised about, I feel like it’s a bit too expensive for what it actually is. I love, love, love this rug. Lightweight, so it’s easy to roll up and store. I’m on my third season with it and it looks exactly the same. We use it on our property in the woods so it gets a lot of leaf litter on it. The rug is super easy to pick up and shake. Good investment. These are all weather and hold up to direct sun and rain. "Is there any red or blue?" Hello lucylaurel, the rug has shades of orange, purple and natural. Thanks for shopping with us! "Can I wash this rug in a washing machine? What are the care instructions please?" Hello Aravind N., this item can be spot cleaned or hosed cleaned and allowed to air dry outdoors. Thank you for shopping with us. "I can't quite tell what the main color is; red, orange or hot pink?? anyone??" Hello Livesimple, we appreciate your inquiry. The predominant color is vibrant orange. We hope this information has been helpful. Thank you for shopping with us! Will be using this in my back yard under an awning. I think the colors will go well with paired furniture. "This rug is described as being reversible, yet there don't seem to be any images of the other side. Thank you." Hello ohmercycj, if you look at the 1st and 2nd picture the colors of the design are different. Have a great day! "I´m writing from Germany. Our measurements are in meter/milimeter. What dimenseion is 6 x 9? is this in inch? Thanks Gisela"
Hello giselamargot, all our rugs are listed in feet. The 6 x 9 feet is converted to 1.8288 meters x 2.7432 meters. We hope this helps and thank you for shopping with us.